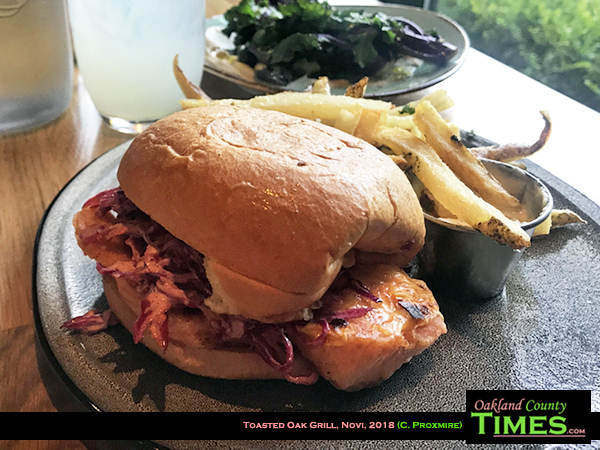 Novi, MI- Based on a suggestion from a reader, I decided to check out Toasted Oak Grill and Market at 27790 Novi Rd, which is near 12 Oaks Mall, and is located inside Baronette Renaissance Detroit-Novi Hotel. 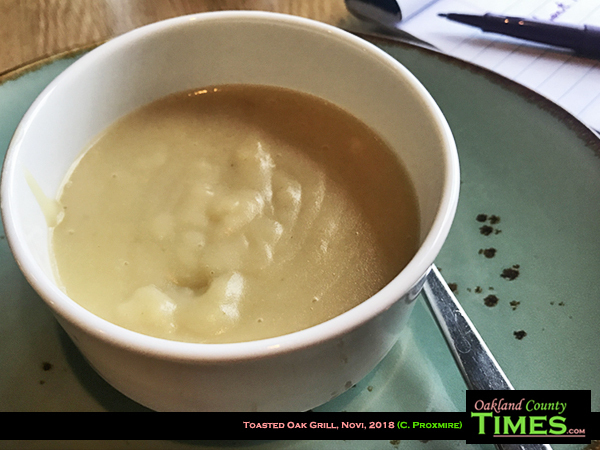 This restaurant focuses on local farm-to-table foods in an atmosphere that is comfortable for romance, friends gathering for lunch, business meetings, or even a writer wanting a pleasant place to work. I started with a cup of potato leek soup. It was the perfect texture to be filling and rich, with the smoked cream and chives giving it just the right amount of flavor. 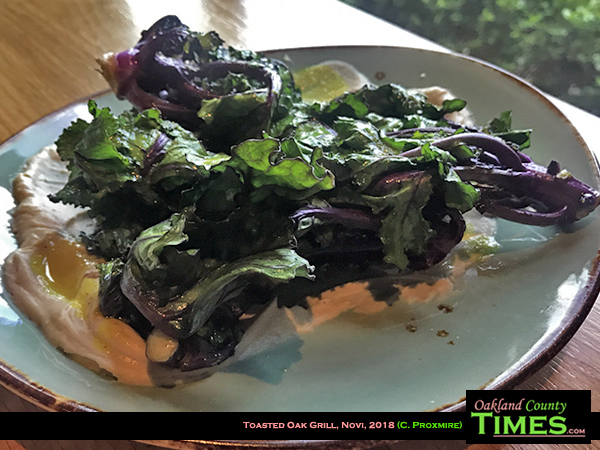 I also had lollipop kale, which was beautifully presented with turmeric vinaigrette, cashew butter and togarashi (which is a fancy name for chili pepper). And for the main course of my lunch I was drawn to the fried fish sandwich. You might think this is not an elegant choice given all the other unique items Toasted Oak Grill offers, but I assure you this was wonderful. The thick piece of rainbow trout was farm-raised here in Michigan, sourced from Cherry Capital Farms in Traverse City. It was fried and served on fresh baked brioche with American cheese, tartar sauce and spicy fennel slaw. It came with hand-cut fries which I enjoyed dipping into the tartar sauce that I had ordered on the side. 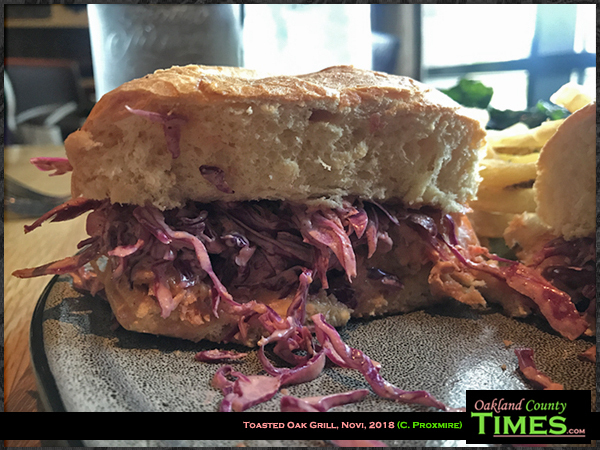 Toasted Oak Grill also has an impressive market which includes Michigan made products and a large selection of wine. Much thanks to the reader that suggested checking this place out. Do you have a suggestion for our Reporter Food column? Join in the conversation on Facebook and leave your recommendations.